Chor der Hamburgischen Staatsoper, Philharmonisches Staatsorchester Hamburg / Sébastien Rouland. Stage director – Herbert Fritsch. Staatsoper, Hamburg, Germany. Saturday, September 8th, 2018. In a post-#MeToo era, Così fan tutte has taken on added resonance. The idea of two couples being groomed by a man for a bet, or that assumption by the boyfriends that their girlfriends could never conceive of being unfaithful, forgetting that they have their own agency, feels incredibly relevant and powerful. 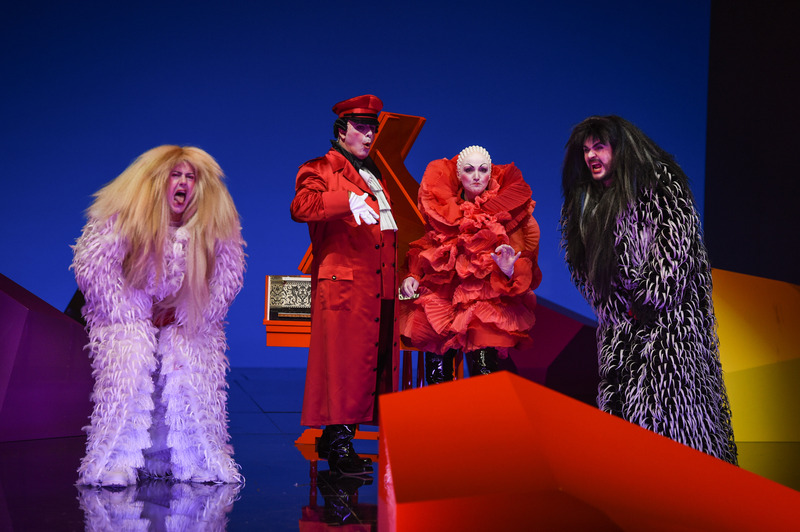 For this opening production of the 2018 – 19 season at the Hamburgische Staatsoper, the house engaged the award-winning director, Herbert Fritsch. This was my first introduction to his work. 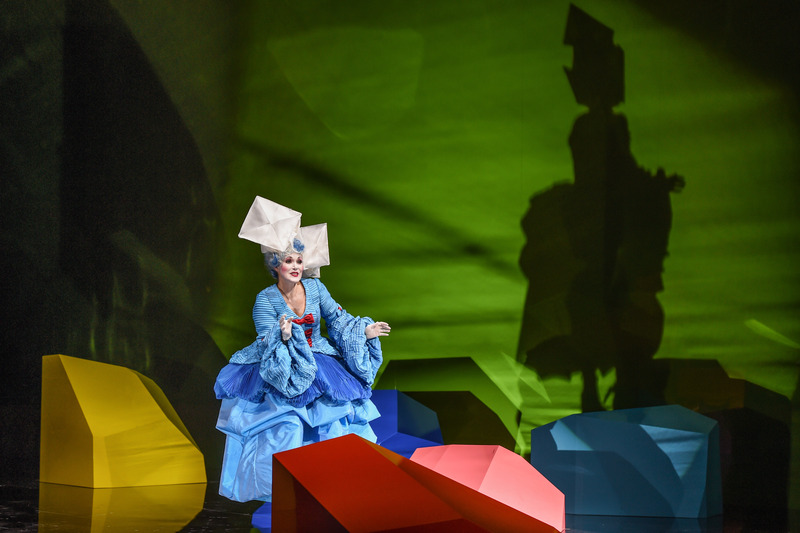 There was a most festive atmosphere in the house, part of the Hamburg Theaternacht celebrations, with the performance being livestreamed to screens on the Jungfernstieg in downtown Hamburg. Surprisingly, it felt that Fritsch’s reading was not one that delved deeper into the text – that questioned the characters’ motivations and highlighted those feelings so vividly illustrated in the score. 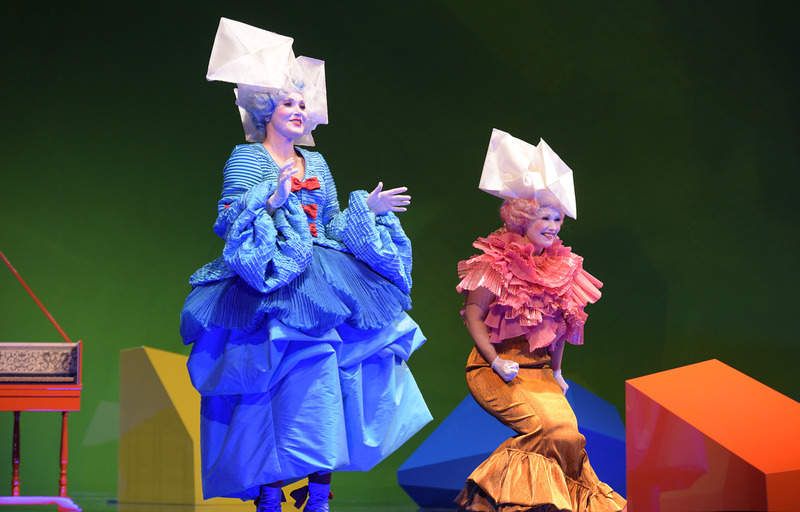 Instead, Fritsch gave us a commedia dell’arte interpretation, with the cast dressed in bright colourful costumes (Victoria Behr), the ladies wearing frilly dresses, while the ‘Albanians’ were dressed up as a cross between extras from Game of Thrones and a 1980s heavy metal band. The result is a vision of the work, which for this spectator at least, remains skin-deep. The commedia dell’arte setting means that Don Alfonso becomes an Arlecchino figure. Fritsch plays the work for laughs and in so doing succeeded in winning over the audience, who rewarded him with an enormous ovation at the curtain calls. His direction of the singers is extremely precise – the constant moving around the stage is executed with remarkable accuracy. Particularly so when, before the curtain rose, we were informed that Ida Aldrian’s Dorabella was a very late replacement for the originally-cast Stephanie Lauricella. Aldrian had managed to learn this complex staging in three days, compared to the seven weeks her colleagues had had. 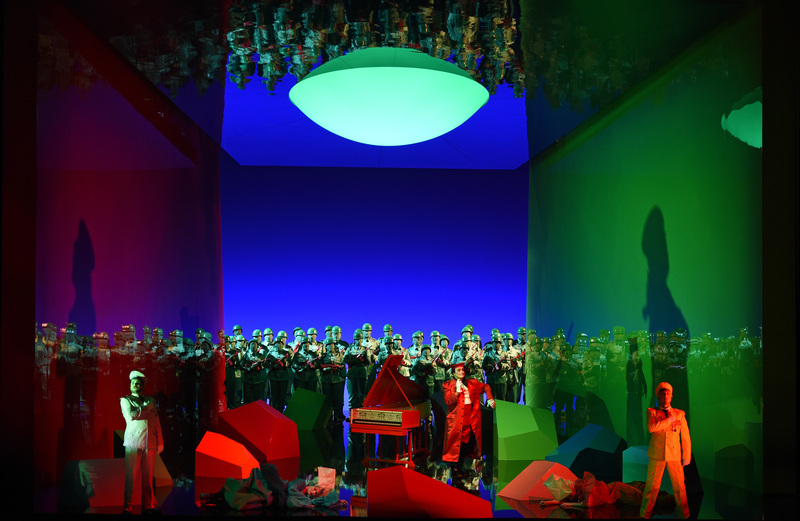 The set (also Fritsch) was centred around a single harpsichord, in turn surrounded by blocks of various colours. Interestingly, the harpsichord seemed to be manipulated remotely by Don Alfonso and at times, the recitatives were accompanied by the remotely-controlled harpsichord, at others by the fortepiano from the pit. It struck me initially that this was meant to represent Alfonso’s invisible influence on events, the proverbial elephant in the room, but its use seemed to be more random than logical. Another aspect I was troubled by in Fritsch’s reading was his portrayal of the ladies. While he brought out the gentlemen’s awakening recognition of their girlfriends’ infidelity with visceral power, ‘per pietà’ which should really feel like the emotional core of the work, lost its impact due to the fact Maria Bengtsson’s Fiordiligi had to make stylized commedia dell’arte movements at the same time. Rather than illustrating the depth of Fiordiligi’s pain, instead it felt that Fritsch portrayed her as easily swayed. It felt uncomfortable, despite the wonderful vocalism brought to the fore by Bengtsson. It was as if Fritsch was reluctant to explore the paradox that, even if the libretto states ‘così fan tutte’, Mozart gives the most heartfelt and psychologically complete of the musical numbers in the work to his leading lady. Indeed, the singing on the whole gave a great deal of pleasure. Bengtsson took a little while to warm up, the floating of ‘soave sia il vento’ somewhat under the note. She dispatched ‘come scoglio’ with accuracy but it felt contained – rather than spitting fire, it was sung with elegance. She found a most satisfying depth of beauty to ‘per pietà’, the pearly, dusky tone enhanced by the use of some judicious ornamentation, enhancing the line and given each variation even more beauty. I just wish that the stage direction had really given her the chance to explore the heartache at its core. 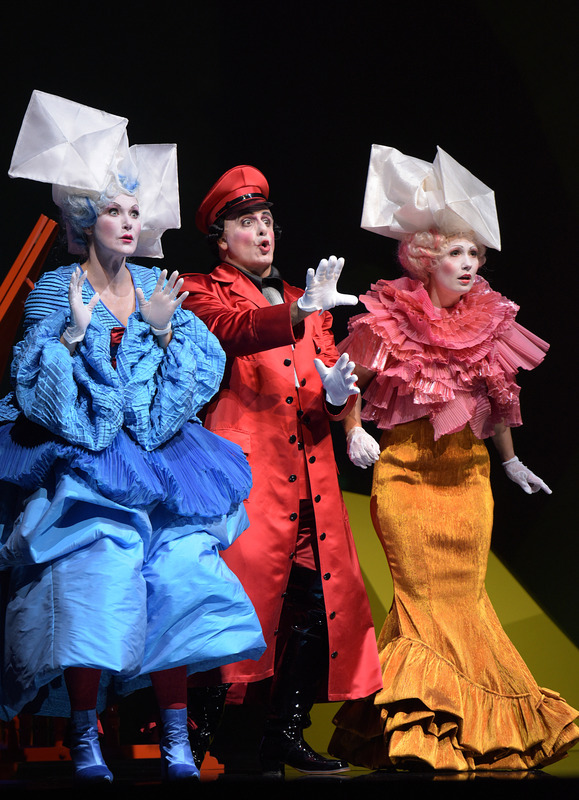 Aldrian brought a youthful, sappy mezzo to Dorabella. She dispatched all of her music with ease, although I’m sure that with more rehearsal she will be able to deepen her interpretation further. Sylvia Schwartz was a vivacious Despina, a livewire stage presence with energy to share. I’m not quite convinced the role is an ideal fit for her – it sounded on the low side for her soprano – but her energy and stylishness were most agreeable. The gentlemen also gave much satisfaction. Kartal Karagedik brought his extremely handsome baritone to Guglielmo’s music. The sound is warm and rich, and always sung off the text. He pulled out a seductive legato in ‘il core vi dono’ and was also able to turn the corners in ‘donne mie’. Dovlet Nurgeldiyev poured out his heart in ‘un aura amorosa’ sung with an easy line and well-placed tone. He sounded somewhat stretched by the more declamatory writing of ‘tradito, schernito’. That said, with his bright, youthful tenor he is already a name to watch. Pietro Spagnoli gave us a deliciously energetic and insinuating Alfonso, his firm baritone and native diction always at the service of his character. Sébsatien Rouland led a reading that felt unobtrusive, that allowed the work to evolve at its own pace. The overture set the stall for the evening with velvety strings and a measured opening, leading to a nicely flowing presto. The strings sounded in places that they could have used a few more rehearsals, not quite unanimous in attack and pitching – not uncommon on a first night of course. The winds really managed to project their character into the texture. The horns were exceptionally well behaved in their treacherous writing in ‘per pietà’. The house chorus sang with attractively-blended tone in their brief interjections. Recitatives felt rushed in places and I would certainly have welcomed much more ornamentation – something truly essential in this repertoire. Musically, tonight was a most satisfying evening. The singing offered multiple rewards, particularly from Karagedik and Bengtsson, and it was fluently conducted. I remain less convinced by Fritsch’s staging. It takes the libretto at face value and I felt a reluctance to dig deeper to discover the pain and heartache, and above all the humanity, below the surface that lives through Mozart’s music. That said, his direction of the singers was extremely impressive and executed with great dedication by the cast. The audience loved it, giving the cast and creative team a uniformly generous ovation.